I know people have pretty mixed feelings for the original Superman from 1978 - I mean, the film is older than I am and in some respects hasn't dated too well in places (although mostly in the fashion department thankfully) - but I actually loved the original movie and still think its worth sitting down and watching today. It's just a great origin story - seeing where he came from, going through high school and racing the train - its just a shame that section of the film was so brief. The new trailer below seems to show Clark Kent as a child, saving his fellow classmates after their school bus crashes into water. We've also seen him running around with a cape in the teaser trailer just like we all did as children. Hopefully we'll get to see a lot more of these early years in the film as he discovers his strengths and abilities. Things get serious in this new trailer from about 1 minute 48 seconds where we can apparently see the destruction of the city with buses and cars flying into the air and buildings collapsing. There appears to even be a few spaceships flying about including hovering around Clark Kent's family home. I won't lie - I haven't read all the comics, or followed Smallville, so I'm not sure what these spaceships are, but if you know, please do let me know in the comments at the bottom of this post. Although I've always been more into Spider-Man as far as super heroes goes, I'm really starting to build up the excitement for this new Superman movie now. I must say that Henry Cavill is really starting to look the part as the Man of Steel and I am a MASSIVE fan of Amy Adams - I just think she is always brilliant in everything she does and I'm dying to see her as Lois Lane. 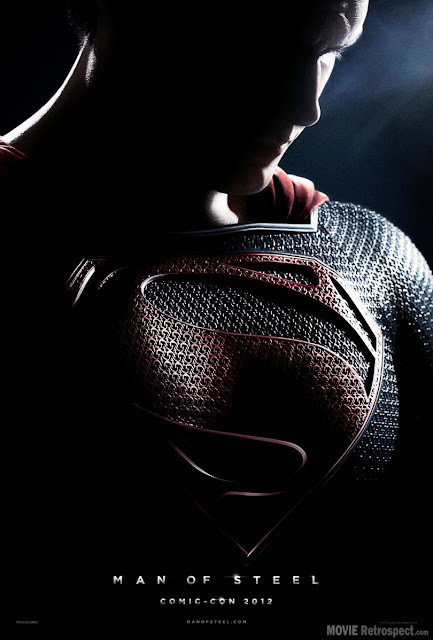 Checkout the new Man of Steel trailer right here in HD and then let me know your thoughts in the comments below. Just in case you missed it, here is the original teaser trailer for Man of Steel. I though this was a pretty compelling trailer the first time I saw it as you don't even get to see the big man with his underpants over his tights until the very end of the trailer. About the Author: Chris Russell has a passion for movies and loves to share that passion here on Movie Retrospect where readers can join the discussion in the comments below or directly to Chris though his Google+ profile. If you enjoyed this post, please follow @MovieRetrospect on Twitter.